Growing garlic (Allium sativum) in the garden is a great thing for your kitchen garden. Fresh garlic is a great seasoning. Let’s look at how to plant and grow garlic. Growing garlic needs cool temperatures. 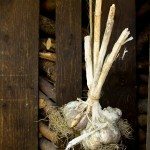 Plant hard-neck garlic in the fall. Where there are cold winters, you can plant the garlic four to six weeks before the ground freezes. In milder winter areas, plant your garlic through winter but before February. 1. Unless your soil is naturally loose, add a lot of organic matter like compost or well-aged manure. 2. Separate the garlic bulb into individual cloves (just like you do when cooking but without peeling them). 3. Plant garlic cloves about an inch deep. The fatter end that was at the bottom of the bulb should be at the bottom of the hole. If your winters are colder, you can plant the pieces deeper. 4. Space your cloves 2 to 4 inches apart. Your rows can go 12 to 18 inches apart. If you want bigger garlic bulbs, you can try spacing cloves on a 6 inch by 12 inch grid. 5. While the plants are green and growing, fertilize them, but stop fertilizing after they begin to “bulb-up.” If you feed your garlic too late, your garlic won’t go dormant. 6. 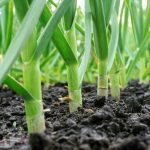 If there isn’t much rain in your area, water the garlic plants while they are growing just as you would any other green plant in your garden. 7. Your garlic is ready to harvest once your leaves turn brown. You can start checking when five or six green leaves are left. 8. Garlic needs to cure before you store it anywhere. Make sure to bundle eight to a dozen together by their leaves and hang them in a place to dry. Now that you know how to grow garlic, you can add this tasty herb to your kitchen garden.